Mid-January and the end of another week crammed with crinkle-crankle shenanigans. Having put out an appeal on Twitter for any and all serpentine spottings, I was an interviewee on Lesley Dolphin's BBC Radio Suffolk show on Tuesday pm (while-I-was-at-work, which made for a devious quarter of an hour). Suffolk folk were sent in search of wavy walls in Sudbury, Framlingham and beyond, and even two of the local MPs (Coffey and Poulter) chipped in. Which is how me and Andy found ourselves beyond Louie Lou's and even the Flying Goose, attempting but not succeeding to pin down the hard-to-find Sibton crinkle-crankle. Maybe Sibton Place, perhaps Sibton Hall? Still puzzling, we hit Peasenhall and remembered our rumbling bellies. 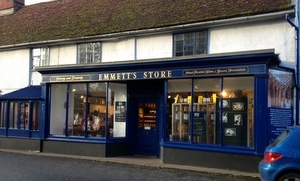 Past Weavers, saved for another time, to park outside the distinguished blue and gold shopfront of Emmett's Store. Plenty of foodstuffs inside. This is a renowned deli and no mistaking. How about a caff? Come and have breakfast at the Emmett's Cafe for only £2.16 per person during January, February and March 2016. Two rashers of our free range bacon, one egg, slice of toast and a mug of hot tea! Seriously? A full English for four coins of the realm? Apparently so, and way cheaper than some of the other options such as the delicious sounding ribs. Here's our piping tea, bag still bobbing in the Emmett's design mug, and then two plates arrive. Oh my. This is some quality bacon and that is some quality banana chutney. Oh me, oh my. Ab fab food. By now, we're somewhat under budget and somewhat over time. No pudd for us. Gotta takeaway a coffee, though, from that Kubrickian machine. As you might expect, that's a top jolt and is presented with a gorgeous Spanish sweet. Fishing around for cash, the lady tells us about the current deal on their bacon. We both buy family packs, and Andy also opts for a jar of the chutney. If that breakfast is a loss leader, it works very well. If it was a car -- Hennessey Venom GT. If they were passing by -- Steve Coogan.